Is it even possible to have such a puzzle? edit: The same question about 4x4 squares. It is not possible, for the simple reason all 3x3 magic squares have the 5 in the center spot of the 3x3 block. 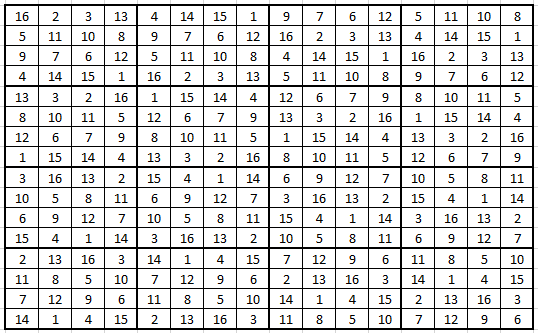 Therefor you'll always get 3 rows and columns in the 9x9 that hold 3 5's, rendering the sudoku part impossible. Notice how I start in the upper left, I fill the top row by putting 4x4 blocks of which the rows are permutated. From there downwards, I build new 4x4 blocks by permutation columns in the 4x4 blocks from the top row. As far as I can see all diagonals within the seperate 4x4's work aswell. Do there exist Graeco-Latin Square style puzzles?